For the past 3 years, First Lady Michelle Obama has transformed the White House’s backyard into a thriving fruit and vegetable garden. She has been using the fruits and vegetables that she grows to feed not only her family, but the local community as well, as part of her Let’s Move campaign to curb childhood obesity and promote healthy living across the country. 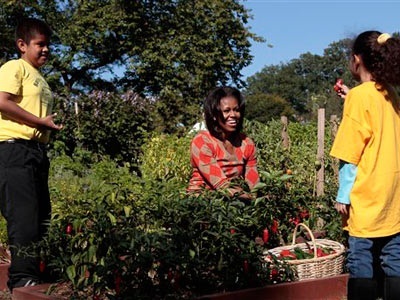 Everyday Health was able to get an exclusive interview with the First Lady, and even added some seasonal recipes that were inspired by Obama’s garden. Click the link below to read the whole story, and get some great ideas for seasonal dishes, with recipes to help you get back in shape!